2016 Alucasa Camelot 64 (Double Unit) Resale Residential Parkhome For Sale On Albatera Mobile Home Park in Albatera, Alicante, Costa Blanca, Spain. This is a stunning 2 bedroom Parkhome, situated on a huge 300sqm plot (site fees only €400 per month) on a British owned Residential Mobile Home Park on the Costa Blanca South. The Mobile Home Park is only 5 minutes from Albatera Town and 30 minutes from Alicante Airport. This newly built Park is in an idyllic rural location, with mountain views and is surrounded by citrus groves. 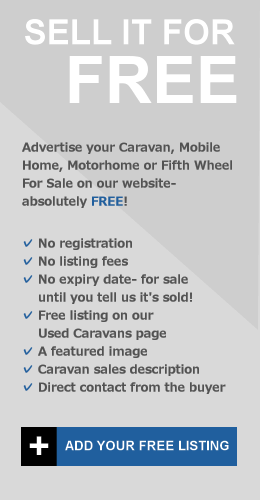 This Parkhome would ideally suit someone looking for a permanent home in Spain, who wants to become part of a small community of British Ex-pats. This is a high spec Residential home with residential fixtures, fittings and furniture throughout. Air conditioning is installed. Mosquito blinds have been installed on all windows and doors. Everything is included in the sale! The front entrance leads into the large living area. The living area is furnished with a cream corner sofa and armchair, fitted display unit with downlighters, fitted TV unit with flatscreen TV and SKY TV, coffee table, 4 seat dining table and chairs, mirror and soft furnishings. The rear entrance leads into a modern white kitchen through double patio doors. Integrated oven, hob, extractor, gas combi-boiler, display units, 4 seat dining table and chairs. The large Master Bedroom is en-suite with shower, toilet and sink/vanity. Double bed, `his and hers’ fitted wardrobes and drawers, overhead cupboards, fitted headboard with integrated side tables. Second double sized bedroom with 2 single beds, fitted wardrobes, fitted headboard with integrated side table and fitted overhead cupboards. Main shower room with double width shower enclosure, toilet, sink/vanity. The exterior areas of the home have been immaculately finished with high quality artificial grass, paving slabs, fixtures & fittings. The home comes complete with a 22 metre driveway! To the rear of the home is a south facing secluded patio area overlooking citrus groves. Separate to the main home is fully independent fitted kitchen with modern fitted units, integrated hob, extractor, washing machine, fridge freezer. Separate utility shed, large gazebo, patio table & chairs. Interested In This Parkhome? 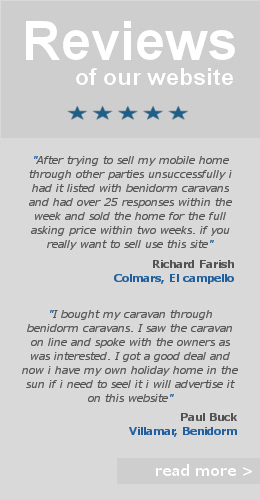 Contact The Seller Directly By Filling Out The Contact Form Below..
Albatera Mobile Home Park Resale Park Homes | Resale Mobile Homes In Albatera, Alicante, Costa Blanca, Spain.